The fundamental components of computers are becoming small enough that they are pressing against the boundaries of the familiar world of Newtonian physics. And nowhere is the scale and precision of operation on better display than in hard disk drives, where a trillion bits may fit in a square inch. But IBM has outdone them all by reading and writing data to a single atom. This advance may be more symbolic than practical right now, but merely showing a working example of atomic data storage, orders of magnitude smaller than state of the art techniques, is practically science fiction. Atoms, it may not surprise you to hear, are pretty much the smallest unit of matter that we can manipulate reliably and expect to stay still. There are interesting experiments with entangling photons, but they’re squirrelly customers. Better to stick to things that don’t fire off at the speed of light if you lose your grip for a second. And a previous atomic storage technique doesn’t actually store data in the atom, but moves them around to form readable patterns (still cool). This means that imbuing individual atoms with a 0 or 1 is the next major step forward and the next major barrier in storing data digitally, both increasing capacity by orders of magnitude and presenting a brand new challenge to engineers and physicists. IBM’s experiment, published today in Nature, takes true atomic storage from theory to reality. It works like this: A single Holmium atom (a large one with many unpaired electrons) is set on a bed of magnesium oxide. In this configuration, the atom has what’s called magnetic bistability: It has two stable magnetic states with different spins (just go with it). The researchers use a scanning tunneling microscope (also invented at IBM, in the 1980s) to apply about 150 millivolts at 10 microamps to the atom — it doesn’t sound like a lot, but at that scale, it’s like a lightning strike. This huge influx of electrons causes the Holmium atom to switch its magnetic spin state. Because the two states have different conductivity profiles, the STM tip can detect which state the atom is in by applying a lower voltage (about 75 millivolts) and sensing its resistance. In order to be absolutely sure the atom was changing its magnetic state and this wasn’t just some interference or effect from the STM’s electric storm, the researchers set an iron atom down nearby. This atom is affected by its magnetic neighborhood, and acted differently when probed while the Holmium atom was in its different states. This proves that the experiment truly creates a lasting, stored magnetic state in a single atom that can be detected indirectly. 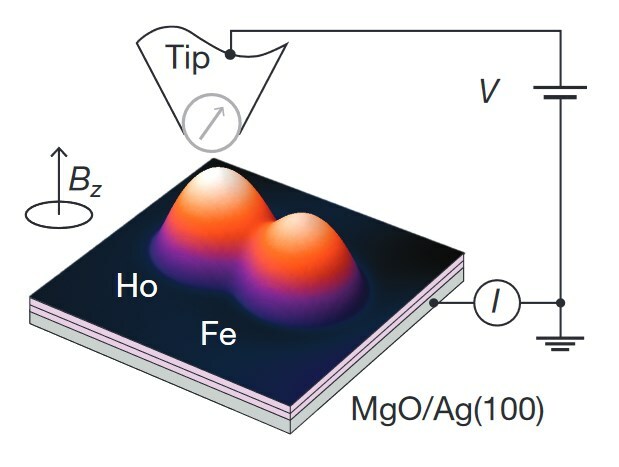 To demonstrate independent reading and writing, we built an atomic-scale structure with two Ho bits, to which we write the four possible states and which we read out both magnetoresistively and remotely by electron spin resonance. The high magnetic stability combined with electrical reading and writing shows that single-atom magnetic memory is indeed possible. I asked Chris Lutz, nanoscience researcher at IBM’s research facility in Almaden and one of the authors of the paper, what caused the atom to eventually lose its spin. If it dampens your enthusiasm somewhat that they’re thinking of looking into molecules rather than single atoms for more practical setups of this idea, don’t worry. One experiment from 2016 exceeding a terabit per square inch used magnetic grains just 5 nanometers in diameter. A Holmium atom is around 200 picometers across; you could line up 25 of them end to end on that grain — or you could, if atoms had “ends.” Of course, it’s much more complicated than that, but the fact is this is about as small a thing in which you can expect to store anything. Sticking two of them together doesn’t change much. “We plan to explore atoms of other elements, clusters of atoms, and small molecules as candidate magnetic bits,” Lutz wrote. It’ll be a long time before you can get one of these in your laptop; this is still very much a lab-bound setup, with ultra-low temperatures and hyper-precise instruments. But it’s hard not to get excited anyway. But is there still more room at the bottom?